Gaslight Coffee Roasters is on the corner of North Milwaukee and West Fullerton Avenues, a wedge-shaped shop which reminded me of the original ReAnimator in Philadelphia. It feels like an old building, with exposed brick walls, wooden floorboards and a whitewashed ceiling and old wooden beams. The door is at the apex, a glass-flanked, recessed affair, while there are windows on both sides, two north-facing ones along Fullerton and three facing southwest along Milwaukee. This leaves two narrow, wedge-shaped spaces to the left and right of the door which are used for bike storage. On the left, four old, fold-down, wooden cinema-style seats have their backs to the second window, a long, narrow coffee table in front of them, followed by a small set of retail shelves. On the right, there’s a line of three square, two-person tables in the windows, with two more in another row towards the centre of the room. In a perfect world, the wedge of Gaslight would form a 60⁰ angle, like the V60 dripper, but alas it’s close to 45⁰. The counter, which faces the door, is aligned with the left-hand wall and is almost an island, but not quite. The short side, directly opposite the door, houses the cakes and till, while along the left-hand side, a slight raised wooden bar provides seven high bar stools with the perfect vantage point to watch the espresso machine in action on the other side of the counter. You also get a good view of the tea-making operation at the back. Talking of the other side of the counter, this is a two-part affair. The first section is at 45⁰ to the front, parallel to the right-hand wall, home to the two-group La Marzocco Strada espresso machine and its two grinders. The counter takes another 45⁰ turn, the remaining part parallel to the left-hand wall. The EK-43 grinder (batch-brew) and hot water boiler (tea) are here, with the batch-brewer underneath the counter. You can sit here one of three low bar stools at an oblique angle to the espresso machine. Behind the counter is a walled-off kitchen, while the rest of the seating is arranged long the right-hand and back walls. There’s a row of four two-person tables against the right-hand wall, while towards the back is a side entrance and frosted window, under which is the green-bean store. A long, communal picnic table with fixed benches that could accommodate maybe 10 people provides the final seating along the back wall. To the left of this, a corridor runs towards the back, toilets off to the left and the roastery, visible through windows, to the right. 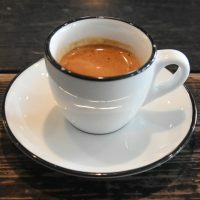 Gaslight offers a fairly concise espresso-based menu with 8/12/16oz cappuccinos and lattes, but with a 5oz cappuccino option, as well as a cortado. During my visit, there was an Amaca from Colombia and a Kayanza from Burundi on espresso, plus a Guatemalan Buena Esperanza on batch-brew. In a clever move, Gaslight preloads the filter papers the night before, putting them in a big stack in an airtight box. When a new batch is required, a filter paper is pulled out, the coffee ground and it’s ready to brew with the minimum of fuss. I, however, wanted an espresso, selecting the Burundi, which was served with a glass of sparkling water on the side. It had a rich, complex, front-of-mouth taste that I don’t have the vocabulary to describe. I paired this with a cinnamon morning bun, even though it was 15:30. This was excellent, a chewy dough with a crisp, cinnamon coating that was neither sticky nor too sweet. This entry was posted in Breakfast, Cafe/Roaster, Cafes, Cake, Chicago, Evening Opening, Island Counters, Laptop Friendly, Lunch, Retailers, Roastery and tagged Chicago2018, Gaslight, include by Brian Williams. Bookmark the permalink.